City Space is a community of just 15 contemporary loft homes. Enjoy a rooftop deck from which to enjoy city streetscape views, and a location off the Memorial corridor close to Historic Grant Park, Cabbagetown, the Historic Oakland Cemetery. Love living near local shops, eateries and restaurants. Community amenities include gated access for added privacy and homeowner security. Commuters will appreciate access to travel routes along Memorial Drive, and I-20. 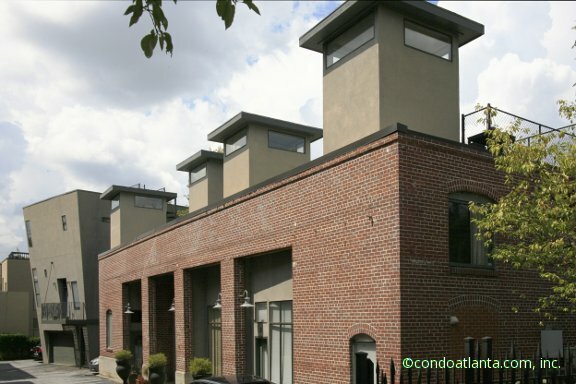 Atlanta Lofts are as wonderfully diverse as the city itself! Authentic loft homes are often built from the structures once the work sites of tradespeople including tailors, blacksmiths, carpenters, factory workers, warehouse and munitions depot laborers. Many of these communities are now part of the National Register of Historic Places. These homes have many of the features considered synonymous with loft living: an industrial feeling about the structure and space, open floor plans, over sized windows, exposed brick walls and duct work, soaring ceilings, cement floors, steel windows and even stair casings! Roof top decks and gardens are a popular feature among loft developments and some include amenities similar to those of other Atlanta condominium developments including fitness gyms and swimming pools! Soft lofts and loftominiums often share in the exterior architectural design of authentic loft homes and include brick, cement and steel among the construction materials. These homes also often include the contemporary polished interiors more typically found in modern condominium development including duct work and plumbing lines neatly tucked behind finished sheet rock walls! Inman Park, Kirkwood, Candler Park and the Old Fourth Ward combine historic area neighborhoods and parks with easy access to the Heart of Modern Metropolitan Atlanta! Walking communities including the lovely development of lofts, condominium homes and townhomes, village style shops and eateries, fabulous art and music festivals are all part of the living landscape that make these areas sweet places for many residents to call home. Love living in Inman Park, a neighborhood on Atlanta’s East Side, host of the Inman Park Festival, and home of the Krog Street Market!